David Byrne has just finished a brief stint in the UK where we saw some seriously impressive performances, the “most ambitious” since ‘Stop Making Sense’. If you missed out, you can catch him on an Arena Tour this autumn. Earlier this year, he released ‘American Utopia’, a “whimsical, weird and totally wonderful” record but one conspicuous for the lack of female artists involved. 1. He was chucked out of the school choir, something he ascribed to his “yelpy” voice. He made recordings on his dad’s modified tape machine (Byrne Sr. was an engineer), and he learnt to play the harmonica aged five. On ‘American Utopia’, however, British producer Bullion plays it. 2. When Pitchfork wrote that Byrne would collaborate with anyone for ‘a bag of Doritos’, Byrne took it graciously and addressed it in How Music Works: "I would probably choose something other than Doritos" but "it isn’t far from the truth..."
He’s spent much of his career working with Brian Eno (whose song ‘King’s Lead Hat’ = Talking Heads! ), and he’s done some great work with St. Vincent. But there are plenty of other interesting collaborations: ‘Here Lies Love’ is a concept album and musical about the life of Imelda Marcos made with Fatboy Slim. It featured the likes of Florence Welch, Cyndi Lauper and Sharon Jones. On The Late Show with Stephen Colbert, Byrne suggested Jared Kushner was ripe material for a musical. ‘Lead Us Not into Temptation’ was the soundtrack to 2003 film Young Adam and saw Byrne working with members from Scottish groups like Mogwai and Belle and Sebastian. He grew up in Dumbarton before moving to Canada and then the U.S. 1987 film ‘The Last Emperor’ won big at the Academy Awards, including ‘Best Original Score’. The soundtrack featured nine tracks by Ryuichi Sakamoto alongside five by Byrne. Anna Calvi released in an EP of covers in 2014 entitled ‘Strange Weather’. Byrne features on the title track, a Keren Ann cover, as well as a version of Connan Mockasin’s ‘I’m The Man, That Will Find You’. Byrne has worked with the Atomic Bomb! Band who try to keep alive William Onyeabor’s music. Its cast includes Alexis Taylor, and the likes of Dev Hynes, Damon Albarn, Young Fathers and the Lijadu Sisters have taken part. 3. The eerie, breathless vocals on ‘Drugs’ by Talking Heads are the result of Byrne jogging on the spot as he recorded it. 4. In ‘Talking Heads’, Jerome David writes that Byrne wanted to become a systems analyst. Thankfully, he didn’t go into computer programming. But Cybernetics has always interested him and was apparently one of the things over which he and Brian Eno bonded. 5. Playing The Building was an installation by Byrne in which he transformed spaces like the Roundhouse into musical instruments. The premise is simple: an old pump organ with an assortment of cables and wires connected to beams, pillars and pipes. 8. He wrote Bicycle Diaries, a travelogue documenting his trips around the world with, you guessed it, a bicycle (or a folding one). In it, he riffs on all manner of subjects ranging from the environment to music, religion and architecture. On the latter he delivered a TED talk, ‘How architecture helped music evolve’. 9. The Muppets did a rendition of ‘Once In A Lifetime’ back in 1996. It’s unclear what Byrne thinks of it, but he did play a leading role in Contemporary Color, a documentary billed by one of its directors as “like The Muppet Show meets Wrestlemania meets late 1970s basketball”. 10. There are plenty of good Byrne interviews on YouTube, including his interview of PJ Harvey. But one of the most entertaining is the interview he does of himself in ‘Stop Making Sense’. Sick of music journalists asking ‘boring, bonehead questions’? Interview yourself! 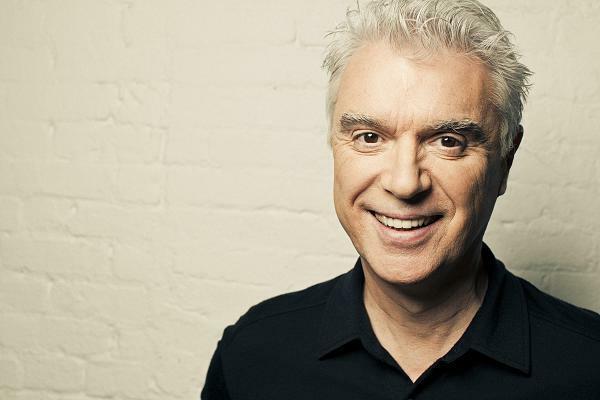 For tickets to the latest David Byrne shows click HERE.